Welcome to the HUGIN IFR BIOTRACER Demontration Activity Website! This website contains information, examples and tutorials on the demonstration activity. The objective of BIOTRACER is to create tools and models for the improvement of tracing accidental and deliberate microbial contamination of feed and food, including bottled water. The aim of the HUGIN IFR Demonstration Activity is to make complex mathematical domain models accessible to non-modelers. One of the main objectives of Work Package 5 (WP5) is to develop a set of advanced (probabilistic) ‘domain models' for decision support on reasoning about food safety and, in particular, support inference concerning the origins of hazards based on (limited) observations. WP5 will include the construction of a large domain model for each food-borne hazard scenario considered. These domain models will provide a consistent scheme for combining information sets from multiple sources into a single quantitative representation and will establish a ‘system wide' view of each food-borne hazard. Each domain model is a quantitative (probabilistic) knowledge representation of a food chain where uncertainty is quantified using (conditional) probability distributions. A domain model describes dependence relations (often cause-effect relations) between elements of the food chain to support decision making on food safety and support inference on the origins of a contamination. The domain modelers of WP 5 use the HUGIN BIOTRACER tool (enhanced in Task 5.3) to construct domain models (see the figure below). 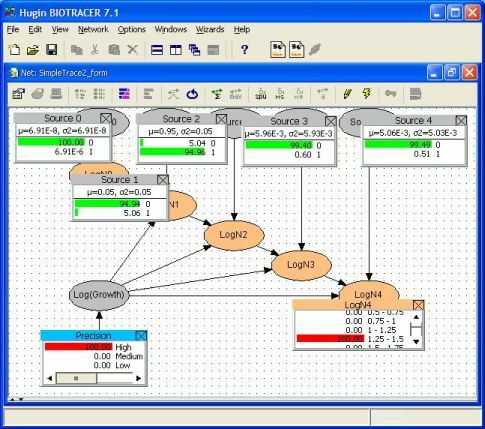 HUGIN BIOTRACER is a graphical user interface well suited for domain modelers. The domain modelers have experience in the use of the technology and in the specification of domain models using HUGIN BIOTRACER. The graphical user interface of HUGIN BIOTRACER is, however, inappropriate for other stakeholders who are not experience modelers as using the tool correctly and efficiently requires a deep knowledge of the technology. Instead a user interface designed for non-modelers is required. Such a user interface should be simple for non-modelers to use, it should support efficient entering of observations, it should simplify the process of extracting results of inference, etc. The main objective of the HUGIN IFR demonstration activity was to demonstrate delivery of service as well as knowledge and technology transfer. Delivery of service has been demonstrated by developing a software solution for non-modelers such that they can access the domain models developed in BIOTRACER WP5 for efficient decision support in the process of reasoning about food safety and, in particular, support inference concerning the origins of hazards. Thus, one purpose of the demonstration activity was in part to illustrate the power of using advanced decision support technology in tracking and tracing feed and food contamination. Knowledge and technology transfer will be demonstrated in the process of a SME software vendor developing a software solution based on domain models developed by research institutions in BIOTRACER. The main focus of the demonstration activity was on increasing the availability and accessibility of domain models and domain modeling capabilities to non-modelers as well as supporting the technology transfer from research institutions to a commercial software vendor.